On March 6, 1967, the American Basketball Association awarded the franchise that became the Kentucky Colonels to Don Regan for $30,000. Later that year the franchise was bought by Joseph Gregory, Mamie Gregory and William C. Boone. John Givens was named as the first coach of the Colonels. 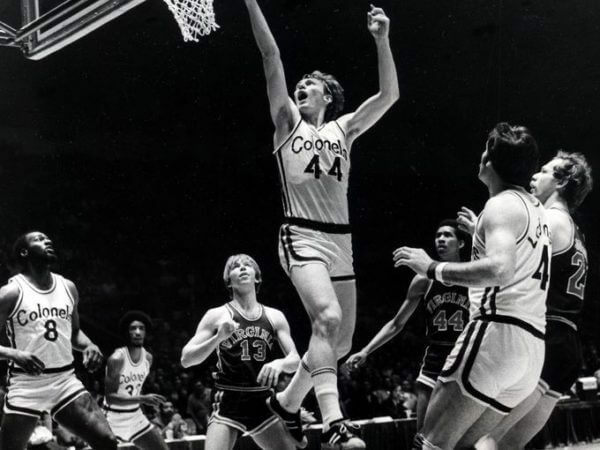 The Colonels draft picks were used on UK standout Louie Dampier, who signed with the Colonels; Western Kentucky University standout Clem Haskins, who signed with the NBA’s Chicago Bulls; Bob Verga, who signed with Dallas, and Randy Mahaffey, who signed with the Colonels. The team also signed Darel Carrier (WKU) and Jim “Goose” Ligon (from Kokomo, Indiana). 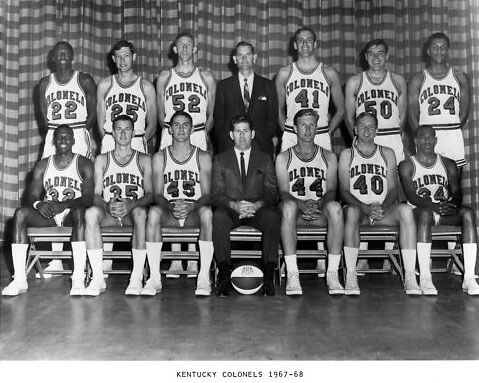 The Colonels’ 1967 – 1968 roster was rounded out with Kendall Rhine (Rice University), Stew Johnson (Murray State), Rubin Russell, Bill Bradley (Tennessee Tech), Cotton Nash (UK), Bobby Rascoe (WKU), Howard Bayne (Tennessee), Orbie Bowling (Tennessee) and Tommy Woods. The Colonels claimed first place in the Eastern Division with a record of 58 wins and 26 losses, but tied with the New York Nets for the division crown. The Colonels’ average home attendance was 8,727. The Colonels began the playoffs with a one-game matchup against the New York Nets to determine who would be first place in the Eastern Division. The Colonels won that game in Louisville 108-99. The Colonels then defeated the Memphis Sounds 4 games to 1 in the Eastern Division semifinals and defeated the Spirits of St. Louis 4 games to 1 in the Eastern Division finals. The Colonels met their rivals the Indiana Pacers for the ABA Championship and the Colonels prevailed, 4 games to 1, winning their first ABA Championship. Colonels owner John Y. Brown offered one million dollars to the NBA Champion Golden State Warriors to play a world title game. The NBA and Golden State refused. Many believe the Colonels were the better team. Hubie Brown went on to coach many teams in the NBA but has always maintained (including in his Naismith Basketball Hall of Fame induction) that the 1974 – 1975 Colonels were the best team he coached. The ABA had entered the 1975 – 1976 preseason with ten teams. After three preseason games, the Baltimore Claws were shut down by the league due to financial problems and unpaid bills. The San Diego Sails and the Utah Stars each folded shortly after the season began, the Sails after 11 games and the Stars after 16. The ABA was reduced to seven teams for the remainder of the season. Shortly after the regular season ended, the Virginia Squires were forced to fold because they could not meet a league-mandated financial assessment. The six remaining ABA teams began negotiations for the eventual ABA–NBA merger. In the end, the NBA agreed to take in four teams—but the Colonels weren’t among them. On July 17, 1976 the Kentucky Colonels ceased to exist as John Y. Brown, Jr. agreed to fold the Colonels in exchange for $3 million. Brown used the money to purchase the Buffalo Braves of the NBA, bringing Colonels head coach Joe Mullaney and point guard Bird Averitt with him to Buffalo. The Braves are now known as the Los Angeles Clippers. The Colonels players were put into a dispersal draft. The Chicago Bulls took Artis Gilmore for $1.1 million. The Portland Trail Blazers took Maurice Lucas for $300,000. The Buffalo Braves took Bird Averitt for $125,000. The Indiana Pacers took Wil Jones for $50,000. The New York Nets took Jan Van Breda Kolff for $60,000. The San Antonio Spurs took Louie Dampier for $20,000. In contrast to Brown receiving $3 million in cash for the Colonels, the Spirits of St. Louis’ owners received $2.2 million in cash along with a 1/7 share of each of the four remaining teams’ television income in perpetuity. That deal has been estimated to have generated over $250 million in the years since. The Kentucky Colonels were a member of the American Basketball Association for all of the league’s nine years. The name is derived from the historic Kentucky colonels. 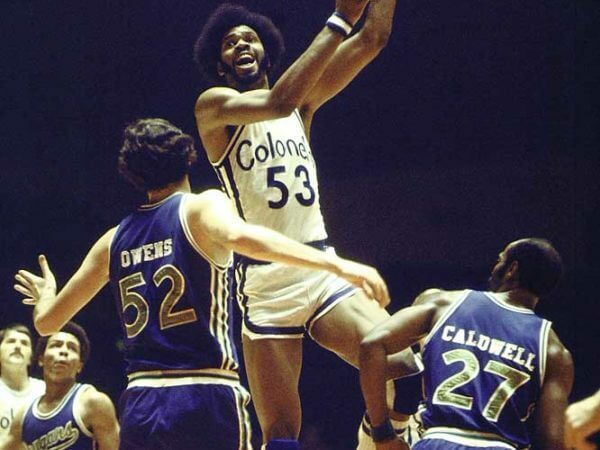 The Colonels won the most games and had the highest winning percentage of any franchise in the league’s history, but the team did not join the NBA in the 1976 ABA–NBA merger. The downtown Louisville Convention Center (now known as The Gardens) was the Colonels’ original venue for the first three seasons before moving to Freedom Hall for the remaining seasons, beginning with the 1970 – 1971 schedule. Colonels – The name is derived from the historic Kentucky colonels. It is a military rank of a senior commissioned officer. Who is the greatest Kentucky Colonels? The Kentucky Colonels were a member of the American Basketball Association for all of the league's nine years.